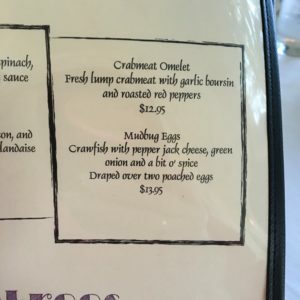 I love to travel, and it’s always fun to use our travels to research upcoming books, because there are unique aspects to every locale—the culture, the restaurants, the slang. I am always learning! Though I’d always thought of New Orleans as being a unique world, I had never thought about the rest of the Gulf shores…until our daughter and her husband moved there. We’ve just come home from visiting, and I realized her area would be a perfect setting for a contemporary inspirational novel someday! 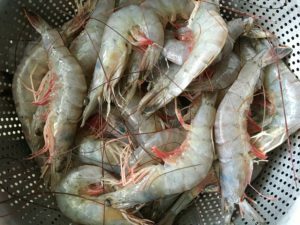 And along the coast, one can purchase out-of-this world fresh caught fish and shrimp right off the dock. Be still my heart! One day we bought fresh speckled trout for the grill, and for two other days, we bought huge fresh shrimp for just five dollars a pound. Until this trip, I didn’t know that the really fresh shrimp have a bluish, iridescent hue…much less know how to clean them. Which I did, with coaching and some trepidation. The second shrimp photo is after the shrimp were cleaned, marinated and grilled. Yum! All wonderful details that could ring true in a book set there. For instance, the night the Formosa termites were swarming near our daughter’s house. I’d never heard of these tiny critters. We hurried home, made sure all the windows were shut tight, turned off all the lights and turned the AC much colder. Apparently these teensy bugs are drawn to light and can get through the tiniest openings (including window screen mesh.) They can come into a house in large numbers, and though they soon die, they leave quite a mess. And then there are the palmetto bugs, and lizards….What a fascinating place. 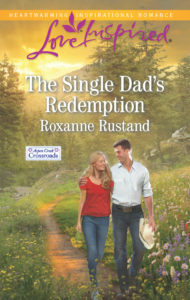 My next Love Inspired, A Single Dad’s Redemption, is the third of four books in my Aspen Creek Crossroads series, and will be out in July. This series is set in scenic western Wisconsin where we have relatives, so the research for that one was easy. I would love to hear some interesting and unique things about where you live! USA Today bestselling author Roxanne Rustand is the author of over thirty-five traditionally published novels, and four indie novels. Prior to 2007 she wrote for the secular market, but since then has been happily focused on inspirational fiction and sweet romance. A Golden Heart winner in 1995, she has received two RT Bookclub Magazine Reviewers' Choice Awards, and has been nominated for an RT Bookclub Magazine Career Achievement Award. She is currently writing for Harlequin's Love Inspired line, and is continuing with self publishing. She and her husband live in the country with three horses, two goofy rescue dogs, and a half-dozen barn cats. I’ve never heard of the Formosa termites, Roxanne. Do they do structural damage like other termites? Living in Charlotte, NC, we have both the ocean and the mountains within close driving range which I really like. I live in Ithaca, NY, and the many state parks, the oh-so-many waterfalls and gorges in the middle of the town are just amazing places to go anytime of the day for a quick lunch break or just going from one place to another. The Cayuga lake connects Buffalo to NY (used to be a main path for water transportation in the past) so we have a nice harbor with many options for our albeit brief summer. I wasn’t into small towns when I first moved here, but this one had so many natural beauties within everyday reach that just take my breath away. Your area sounds beautiful, Priscila!! I’ve never been there. Do you take lots of photographs? Well, I’m quite biased because I do think it’s beautiful. We do in fact try to take pictures at all seasons.. the best ones are in the summer of course (a few of them can be found here: https://goo.gl/photos/9vTXw41hzemQE6Rc7). My husband and I were trying to capture them all, but we gave up at some point and just decided to enjoy it. I live in Burke near Washington, DC. I love the local farmers market where we can get honey, salad, fruit , etc. All grown or made within 125 mile radius. There are fresh Mexican tamales and hand made fresh crab cakes as well as locally made bread. It is wonderful!! I’m surprised by the number of people I talk to who live here and don’t know about it. Diana, that sounds delicious–and like lots of fun!! I loooove good crab cakes, and they are so hard to find in the Midwest! I live in Mechanicsville VA, which is near Richmond VA. Our community has a lot of activities for families. We have the annual Hanover Tomato Festival which draws large crowds. There is also Lewis Botanical Gardens which is in close by Glen Allen. I love living in a community which offers a lot of activities for all ages. I live in Scotts Valley, California, very close to Santa Cruz. It’s northern California, so the beaches don’t have warm water like southern California. However, we do have gorgeous scenery along the coast. Earlier this month a friend from Hong Kong was visiting, and every time we went to the coast, we got to see humpback whales!!! Visiting the places you mention would be fun, but I have no interest in any of the food. I am NOT a crawfish or any type of seafood fan. You asked about things unique to the area where I live. Here we have smoked brisket and it is delicious. They even have cook off contests to see whose smoked brisket is the best. :) We also have the Tour de Cypress, and in a nearby town, we have a old car parade and show certain times of year. In the town where I grew up, every year we have the Hopkins County Fall Festival which includes the Hopkins County Stew Cook Off. Contestants make their stews overnight in a big cast iron pot over a fire. Then the next morning, visitors pay $5 and get to eat all the stew they want from whatever contestant(s) they want until the stew is gone. Here’s a link that tells more about it! It’s a lot of fun and a lot of great food! I’ve lived in numerous places, and all of them have something unique. We live in AZ now, and the terrain ranges from snow-capped mountains to desert valleys to desert highlands. Summer temps during the day can range from 115 degrees to 85 degrees, depending on your elevation. Ive always lived in Tuscaloosa, Alabama. Whenever we get the chance my husband and I love to take our RV to Gulf State Park in beautiful Gulf Shores, Alabama. It’s about a five hour drive from where we live. I love the white sand beaches also and the sound of the ocean is so relaxing to me. Live in SW Michigan @ a mile from Lake Michigan with its sandy beaches, sand dunes and beautiful sunsets. The climate is excellent for producing blueberries, cherries, peaches, grapes and apples. We have many local vineyards – wines that wine national awards and are even served on the White House. Most vineyards have tasting rooms, tours, and restaurants with many activities. Farm to table restaurants are abundant. Local festivals around all major holidays. Our town every summer has an Art Fair and we in our downtown we display sculptures painted by local artists. One year there were bears, another beach toys, this year we have cute artsy bugs, they cause no harm and kids can climb on them and memories are made walking through downtown, along the bluff or along the shore – watching kids play in the Whirlpool Compass Fountain, riding the carousel, finishing with dinner at Silver Beach Pizza or with an ice cream cone or fudge from Kiliwan’s. I live in southeastern BC, Canada, and it is very beautiful here with tree-covered mountains, clear lakes, and tumbling streams. We live in a farming valley near a large lake, and have the best of all possible worlds in my opinion! I featured my region in my Riverbend Romance novellas. Hi Roxanne! I live on the Oregon coast so we have a lot of restaurants that serve all kinds of seafood & fish and also places to buy fresh seafood or fish. You can even go into the next town up from us by a few miles, and buy freshly caught salmon or other fish and dungeness crab right off the boats moored down on the docks. Clamming and crabbing are very popular here too. You can have fresh clam chowder just about anywhere you eat at. We also have quite a number of fishermen out here & they dig up what we call sand shrimp to use as bait. As the name indicates, you dig them up under the sandy beach. They are quite ugly to look at, but the salmon love them! We also have no-see-ums, almost invisible tiny white mosquitoes that fly all around you. They are more annoying than anything else really. And for that I’m thankful for, because mosquitoes love to eat me up, these ones don’t bite me :-) Did you know crane-flies are the male counterpart to mosquitoes? They are huge in comparison but again, don’t bite! I’m sure each area of the States have their own unique things to boast about! 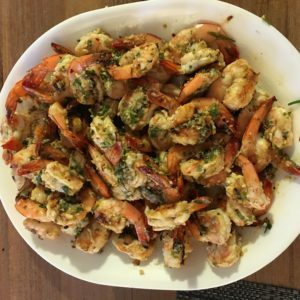 Now you have me hungry for seafood (shrimp, crab, fish or any shellfish…haha)!